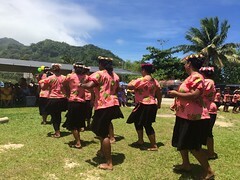 I moved from Northern California to Micronesia in June 2015. The decision to pack up my life into two suitcases for my two-year Peace Corps service was immense. I had spent a year after college graduation (San Francisco State University BA Journalism 2014) writing for my hometown newspaper and searching for “the job.” My decision to accept my invitation to serve in the Peace Corps during my time of transition from college to career was unnerving but, I knew life was calling. Fast forward and I have successfully completed my service as of August 2017, and not to sound cheesy but I have found that everything about the saying “Peace Corps is the toughest job you’ll ever love” is exactly true. Now that I am back home I miss seeing the faces of my students that I taught for two years, my co-workers whom together we created empowering programs for youth, and lastly but not at all least the host family that became my forever family. Disclaimer: The views and opinions expressed in this blog are entirely my own and do not reflect any position of the United States government or the Peace Corps. MY GRANDDAUGHTER LEFT THIS MORNING GOING TO THE SAME PLACE AS YOU ARE. SHE IS ALSO GOING TO TEACH. IF YOU GET IN TOUCH WITH US WE WILL GIVE YOU HER INFORMATION. PLEASE IF YOU GET THIS GET IN TOUCH WITH US. Hi Liz! Thats great to hear, my email is jasmindtaylor@gmail.com, shoot me an email at I’ll hope to meet her soon!